No war in modern history has had so many armchair generals, cocktail party strategists, and amateur field marshals who second-guess everything than does the conflict in Southeast Asia. Politicians, whose military experience was probably limited to World War II gasoline rationing, suddenly became experts on jungle tactics and psychological warfare. Editorial writers, some of whom have boarded nothing larger than a swan boat, turn up as critics of Navy intelligence procedures which led to the capture of the USS Pueblo. Perhaps this is as it should be. Since the first Colonial farmers shouldered flintlocks to take on the British Redcoats, Americans have fought their wars as much with their mouths as with their muskets. As General Omar Bradley once pointed out, "If the troops aren't griping about something, then there's something wrong with morale." By this standard, morale here in Washington and across the country was exceptionally high this past week as people followed with dismay the second week of the hydra-headed Viet Cong offensive against the cities and key towns of South Vietnam. It was an offensive that burst on the world the week before, and it had been described by US military men in Saigon as a "last gasp" desperation attack," a "diversionary move" which failed in its design to force the American command to weaken its defense of the northern province, and finally, as told by General William Westmoreland: in repulsing the guerrilla uprising, the Allied forces in South Vietnam had won a significant victory. At the same time, Westmoreland alerted his troops to the possibility that the Viet Cong and their North Vietnamese allies could reorganize themselves and launch a similar new offensive at any time—an admission that the General's so-called "victory" was not quite as complete or decisive as his words implied. It was less than two months ago that General Westmoreland and the US Ambassador to Saigon, Ellsworth Bunker, were in Washington and broadcasting to the world such statements as: "The Viet Cong has suffered such losses in the South that the guerrilla army now is incapable of mounting a major attack." Ambassador Bunker stressed that last year's elections and the adoption of a democratic constitution by the new South Vietnamese legislature meant that the people of the South at long last were showing their showing their confidence and gratitude for the military shield the United States was providing them. 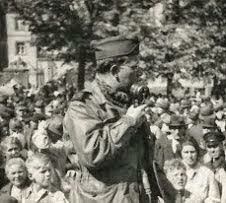 Thus the US was not only winning the military struggle for the country, but also that important "other war" as well. The "other war," of course, is also called "pacification of the countryside," or sometimes "revolutionary development." And more and more rarely it's also called "the battle for men's minds." Viewed in the retrospect of only six weeks, it would appear that the highly optimistic year-end assessments by Westmoreland and Bunker were not only wrong, but also that these two top US officials in Saigon perhaps made a dreadful mistake and somehow became victims of their own wishful thinking and, even worse, became victims of their own propaganda. It is now obvious that Westmoreland badly underestimated the guerrilla capabilities of the Viet Cong. In fact, professional military men at the Pentagon privately give grudging admiration to the to the Communist guerrilla command for its skill in organizing simultaneous attacks by an estimated force of some sixty thousand irregulars on more than thirty-five population and military centers the length and breadth of South Vietnam. 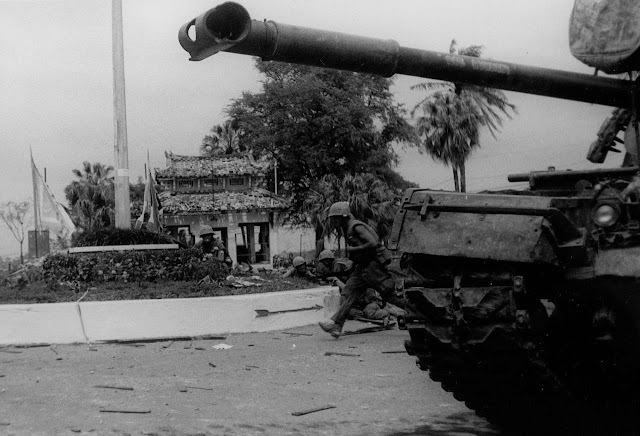 The attacks ranged in size from small commando squads of fifteen to twenty men—as was the group which blasted its way into the US Embassy grounds in Saigon—to combat teams of two hundred or so men such as those that moved in on the ancient capital of Huế in the north. Whether or not the Viet Cong attained all of their objectives, the fact remains that the guerrilla offensive paralyzed the country, embarrassed the US and its allies in Vietnam, demonstrated the laxity of the Saigon government leadership and, most of all, exposed the weakness of Allied intelligence about the enemy in Vietnam. It is true that Westmoreland's headquarters had issued warnings at least two weeks prior that there might be a Viet Cong attack during the Tet New Year's celebrations. In fact, partly because of this advance knowledge, the US refused to observe the Tet truce in the northern part of the country where the North Vietnamese army had massed four and possibly five divisions for an attack across the Demilitarized Zone. But neither the US Military Assistance Command nor the South Vietnamese counterintelligence net had information that the guerrilla offensive would be so widespread or ambitious, or as deadly. Apparently the end is not yet in sight. The most melancholy and discouraging aspect of the whole dreary business is the knowledge that the Viet Cong could not have mounted its countryside uprising without either the cooperation or at least the acquiescence of great numbers of the Vietnamese people who live and still seek refuge in every major town and city in South Vietnam. The explanations that are still coming in say that this demonstrates the basic ignorance and neutrality of the mass of the peasantry, now weary of more than twenty years of war. Others say that it demonstrates the ruthlessness of the Viet Cong terrorists and their hold over the people. But the past two weeks have proved that all of the bright predictions about "political neutrality" and progress in winning the "other war," as well as the increasing signs of confidence in the new Saigon regime—that all of this optimism was badly out of joint with the facts. In fact, some of the pessimists reporting from Saigon say that the guerrilla offensive—with all the civilian bloodshed and unprecedented devastation in cities and towns which up to now had escaped the ravages of battle—that this injury to the civilian population in South Vietnam means that the United States and its allies have left the "other war." They say that the real meaning of the past two weeks of fighting is that the Communist commandos have inflicted a most tragic and irretrievable defeat on the United States. Maybe so. We must wait and see. Meanwhile there is much soul-searching going on here in Washington as well as in Saigon, and of course there will be the demand for investigations. For in the aftermath of the Viet Cong offensive, the American people are grousing, and their grumbling is being heard on the national sounding-board which is the Congress. The Hawks and the Doves will be at it again, hot and heavy. It is to the credit of the political leaders here in Washington that there has been no crisis in confidence in the US military leadership in Vietnam. As of now there has been no hue and cry for a scapegoat, although at least one Washington columnist, Marquis Childs, speculated the other day that President Johnson may want to re-juggle his generals before long and get a fresh approach to the Southeast Asian conflict. There has also been speculation that the Vietnam crisis may require another 200-250 thousand American GIs to bring the situation under control. It's a suggestion which gets short shrift at the White House with the presidential campaigns now only months away. Standing in the wings and waiting to be heard is another group of critics who say that the US military command has never understood the basic nature of the entire Vietnam struggle, and who maintain that American actions and strategy are in fact pushing the country into the Communist orbit rather than the other way around. These critics maintain that the Southeast Asian struggle is basically political rather than military. They contend that General Westmoreland's "forward strategy" pits American power against the Communist main-force units and ignores the basic elements wherein US influence should be most effective: against the guerrillas and the Communist regional forces. This "forward strategy" left it to the South Vietnamese army to secure the rear areas, and this has been a failure. Instead of securing these population centers, the Saigon troops have succeeded mostly in antagonizing the people while the South Vietnamese officers impose bribery, embezzlement, and shakedowns on the urban centers. The reassessment of US tactics and strategy—which eventually will come—must also consider the one political and military fact to emerge paramount from the Viet Cong guerrilla offensive. That is, the guerrillas were ready to fight and die for their own cause. There was no such motivation among the great bulk of the Vietnamese people who became victims of that attack, nor apparently from a large section of the South Vietnamese army. In any case, the Southern army wasn't in great evidence, because the Saigon generals and their military colleagues in the field had given many of their men official leave in order to celebrate the Buddhist New Year. It was a most expensive holiday. 1948. "The Man Who Killed Stalin"